In spite of increasing adoption of EHR (Electronic Health Records) systems by healthcare providers and organizations, paper records are still a primary source for tracking information for over half the respondents to a new survey from Anoto, a developer of digital pen and paper technology. The results confirm that many within the healthcare industry (as in many other industries) consider paper to be too embedded in the culture and adopting new technology to require too much money and training time. Interestingly, an overwhelming majority of survey respondents (almost 90%) with an active EHR system in place believe that EHRs improve patient care. 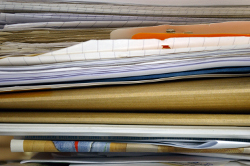 Even so, nearly 80 percent of respondents are still using paper records, and more than half the survey’s respondents spend a minimum of a quarter of their time at work writing or processing paperwork, and don’t feel that the Patient Protection and Affordable Care Act will reduce the amount of paperwork they will have to deal with. SimplifyMD is a ‘hybrid’ EHR, in the sense that it utilizes the format of a practice’s existing paper forms (from scanned images) and then maps data fields to the existing places on the forms, allowing the practice’s workflow to remain essentially unchanged while still adopting new technology and achieving meaningful use. Microwize Technology, a leader in the push to EHR/EMR adoption, can assist medical practices with a smooth transition to electronic health records using SimplifyMD. More information on the survey can be found at Anoto’s Web site.